Because today was a holiday, I do what all Americans do on Labor Day. I cleaned the bathroom drawers. You know, the ones where razor blades and cotton balls and the toothpaste samples from the dentist go, and never come out again. When I got to the back of the bottom drawer, I found a little zipper bag. I expected to find a electric shaver, but when I opened it, I found a camera. I think it belonged to my parents - both of whom have been gone. The batteries were corroded, so I removed them and cleaned the contacts. T found some new batteries, I installed them, and I figured out how to take a picture. 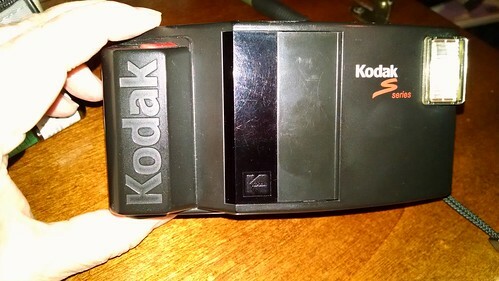 The shutter, film advance, and display all worked. The flash did not. After the photo I took, there are still 14 frames left - if the display can be trusted. So I guess I'm going to take some outdoor photos and then get the film developed. T said, "The film is probably already ruined." "I know," I said, "but I have to try." Yes, you must! I got pictures of my aunt in nursing school in the 50's from a Brownie camera. They came out really good! Respectable business person by day. Fiber wrangler, stargazer, writer, and poetry solicitor by night.